This walk is just a little over 9 miles (with the option of a shorter 6 miles). Across mostly flat open countryside, but incorporating an interesting church, pleasant woodland and the delightful Kenilworth castle. 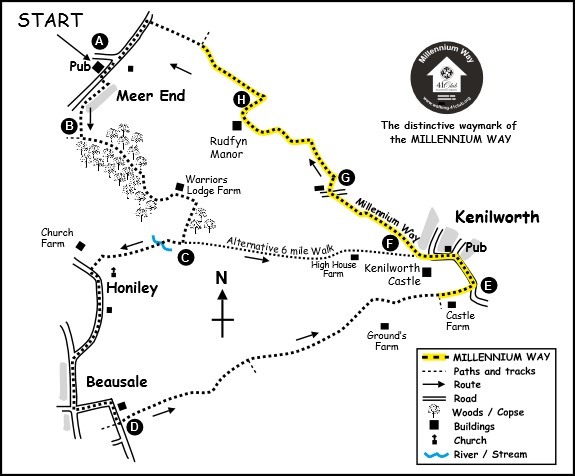 The walk starts and finishes at The Tipperary Inn, where walkers are very welcome, refreshment can also be obtained half way round at The Queen & Castle pub, opposite Kenilworth Castle. There are no difficult sections on this walk and the four easy stiles near the end of the walk can be bypassed by gaps to the side. It is a very pleasant introduction to The Millennium Way. The Millennium Way section is clearly waymarked with the distinctive black Millennium Way circular waymarkers. Find out more about the walk by clicking on the information icon. Leave the Tipperary Inn car park to the main road ( A4177) and turn right in the direction of Warwick for about 100 yards to take the public footpath left through metal gate. Keep ahead between fence and hedge to take kissing gate right to field. Go left with hedge to pass houses left then across drive following the yellow waymarker through the next metal gate by pond right. Cross over the next drive to take the two gates through paddock area across track keeping bungalow left to take the next gate. Continue between hedge and wooden fence, take gates across driveway into small paddock. Take the wooden waymarked kissing gate directly ahead past cottage left following the yellow waymarker. Go through a metal kissing gate staying between hedge and wire fence to the next drive by corner barn. Go left then right across stream through large wooden gate continuing ahead on a well defined path. Take another metal kissing gate, go past Blenheim Barn on left to take kissing gate right continuing along a partly boarded footpath. Go through two further metal gates then go left on bridleway along a lovely woodland path. Keep ahead on well defined path through the wood ( often muddy ) eventually emerging by a way post into large field to continue right with trees right, along woodside path. Go through gap ahead at field corner and turn left to stay on bridleway, keeping hedge left. Stay ahead passing to the right of green silos and metal barn to join farm access track. Walk right along track, under power lines, towards the wood then after 100yds turn right ( by waymarker at corner of wood ) down wide track keeping wood left to reach crossroads of paths where you will find a waymarker post. Turn left by waymarker post and keep along side of field keeping hedge left. Stay ahead through gap into next field keeping hedge left. Cross plank bridge at field corner and continue into next field going under power lines. Go through kissing gate and continue with hedge right. Take the next kissing gate, go across track following yellow waymarker then go 1/4 left to reach and cross a small wooden footbridge, ( there is a rudimentary yellow topped waypost here ) passing by some earthworks on your left ( known as The Pleasance ) to exit by corner wooden kissing gate. Here you will find an information board giving an interesting account of "The Pleasance" the remains of which are still visible. It was constructed by Henry V in 1414 as a moated pleasure garden. Continue along a well defined tree covered path eventually passing High House Farm on your right. Kenilworth Castle will soon come into view. At the rise continue gently downhill towards the castle keeping a look out for a footpath left. Access this footpath by metal kissing gate signed Chase Lane 3/4 mile. You are now at letter F below. ( You have now joined The Millennium Way ). Turn right and continue with hedge and ditch right to field corner. Cross stream by wooden footbridge and go ahead with trees left. The path bends right then left and continues gently uphill. Stay uphill with trees left and at the end of the path take gap by waymarked wooden post and follow waymarker left to take next metal gate to field. Cross centre of field and exit by gate to lane. Turn left on lane passing the entrances to St.John Baptist Church and Honiley Hall. (The church is worth a visit - built in 1723 by Francis Smith - reputedly from a sketch drawn on a tablecloth by Sir Christopher Wren who was dining with Francis Smith at nearby Honiley Hall. The stained glass windows are a particular delight). Continue down the lane to the T-junction and turn left, to eventually reach a crossroads where we leave Honiley Road and turn left. Follow lane round where it veers right and 60 yards past Hill Farm take the waymarked track on left. Go through metal kissing gate ahead (gate itself missing) to field, and continue straight across two fields following the yellow waymarkers. Go through metal kissing gate next to the large oak tree and continue straight ahead over next field. Go through next gap ( gate missing ) and stay ahead over next field. Go through next gate following the yellow waymark half right across field. Proceed through field corner gap keeping hedge and trees right. Pass a small pond right then go through gap (ignore footpath immediately right), but go ¼ very slightly right across next field following line of trees left towards centre pylon directly ahead. Continue through mid hedge gap ( gate missing ) over ditch then across centre of next field to pass under power lines. Go through gap/stile ahead and stay on same heading through a metal gate then across centre of next field to take footbridge and metal kissing gate into next field. Go half left across field to exit by metal gate. Go slightly ight to field corner to take a corner metal gate. Stay with hedge right to walk under power lines ( you will shortly have a grand view of Kenilworth Castle ) and continue ahead on well way marked footpath, through metal kissing gate and wooden kissing gate in the direction of the castle. Stay to right of castle, and eventually you will exit through wooden kissing gate to a lane by car park. Turn left here, past entrance to castle, down car park access lane to main road. Turn left on main road keeping castle left to reach the Queen and Castle pub. Facing the pub go left up main road ( Castle Road ) to the bend (You are now on the Millennium Way), then take lane left (Purlieu Lane). Here you will see the distinctive black Millennium Way waymarker on the way post. Continue down lane, go under power lines and after 20 paces take kissing gate right (signposted Chase Lane 3/4 mile). Go diagonally half left up field to gap. Go though gap and take well defined left hand footpath keeping ahead to take mid hedge kissing gate then across field to find copse at field corner. Enter copse and exit by kissing gate to field. Go with hedge right to find kissing gate right. Take gate and go 1/2 left diagonally across field towards houses, keeping the farm buildings on your far left to reach and take kissing gate to road. Go right on road for 10 paces taking kissing gate left to field (signposted Meer End). Continue with hedge left to field corner. Cross ditch bridge left and go through small copse then ahead with hedge left. Go through next copse then down field to find mid field gap with ditch. Cross ditch and go directly across field to hedge where you will find a waymarker post. At the hedge go left around field edge with hedge right to exit by wide field corner gap with another waypost. Continue round edge of next field keeping hedge right. Go through gap ahead and immediately left keeping hedge left to pass under power cables ahead. Approx 100 yds after passing under the power cables watch out for waymarker post and bear right across field in direction of house to field corner. Continue with hedge left past houses and follow waymarker sign left passing by side of copse adjacent to houses to reach driveway. At the driveway turn right walking away from Rudfyn Manor and continue along for approx 100 yds to reach a track entering from the right. At this point turn immediately left to cross the field, passing 10 yards to left of a large solitary oak tree. Stay ahead across centre of field aiming for a yellow topped waypost by field corner edge where you again find a distinctive black Millennium Way waymarker. Follow the waymarker very slightly right then after 10 paces take gap left then immediately right to stay up field with hedge right. Follow around field edge up field to far mid hedge stile. Take stile and go over ditch bridge. Bear left to way post following waymarker across centre of next field to find waymarker and kissing gates. Take both kissing gates and go ahead with hedge right to find a mid field kissing gate/footbridge on right. Ignore this kissing gate because at this point we leave The Millennium Way. Instead, stay ahead keeping hedge right to take wide corner gap to reach a large locked gate ( Oakwood Security ). Turn right here by side of gate down gravel path past large green metal barn on left emerging on to track. Stay ahead following yellow waymarker keeping hedge left to reach field corner. Go right 20 paces then left through wide gap then across field to find and take stile to the main road. Go left on busy main road to walk along verge passing St. Michael Stud , eventually returning to your starting point at The Tipperary Inn. A Pub with an interesting musical past. Harry Williams parents were the owners of this pub. Harry was the co-writer of the 1912 marching song 'Its a long way to Tipperary'. 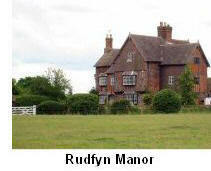 It sold over a million copies and he used the royalties to buy the pub and associated cottage for the family. 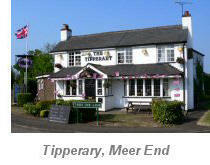 They changed the name of the pub from The Plough to The Tipperary. The first turn left off the Warwick Road is opposite Tipperary Cottage. This part timber-frame grade II listed building was a Tudor hunting lodge for the Deer Park of Kenilworth Castle. In about 1414 Henry V had "The Pleasaunce in the Marsh" built about 800m west of the castle. This was a timber-framed banqueting house surrounded by a moated earthwork about 180m by about 150m that 15th century kings used instead of the castle's state apartments, sailing across the Great Mere. In the 16th century Henry VIII had the banqueting house demolished and the materials re-used for new timber-framed buildings inside the castle. 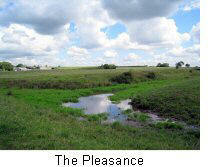 The mere was drained in 1649 but "The Pleasance" earthworks survive and are a Scheduled Monument. Not accessible, but visible in the garden on the left before reaching Honiley church, was a place of pilgrimage, being used “for the cleaning of incontinent penitents". Reputedly designed by Sir Christopher Wren in 1723 and fortunately not ‘modernised’ by the Victorians, the church retains its original atmosphere. 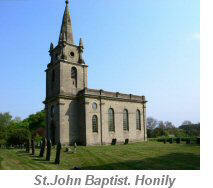 In 1914-15 Honiley Hall was rebuilt as we know it today. It was used as an educational establishment until 1992 when it was sold back into private hands. 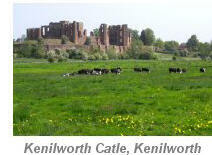 A full historical note on the castle can be found in the ’points of interest’ page for circular walk 24 – Kenilworth. Once a hunting lodge on the castle estate, built by Robert Dudley, but sold off in 1917, this part-Tudor listed building stands well, with spectacular views.